Rachel Roth is like many teenage girls. She feels awkward around other teenagers, doesn’t think she fits in anywhere and is worried about finding acceptance. She’s also secretive and ashamed of her family. Unlike most teenage girls, Rachel has very good reason to think that she’s different. There’s nobody else she’s met who was raised in another dimension. None of her few friends (well… acquaintances, really) had a mother who was part of a cult. None of their fathers are demons. And none of them are secretly superheroes. This is because Rachel Roth is Raven. Born to serve the darkness, but possessed of a good soul that rejected the evil purpose that was her destiny, she is a powerful magician and part of the Teen Titans. She is also, unbeknownst to her, the fulcrum in a future apocalypse that must end in her death in order to maintain the balance between good and evil. The character of Raven has never been more popular and yet never been more unknown. This is something of an accomplishment given that the character was already a figure of great mystery when she was first introduced in Marv Wolfman’s and George Perez’s now legendary The New Teen Titans series. The young half-demon was originally more of a deus ex machina than an actual character in her earliest appearances, existing only to magically pull the other Teen Titans to some crisis before disappearing, not explaining who she was or how she knew the rest of them. She was also sweet but restrained – a far cry from her fear more moody incarnation in the Teen Titans animated series and certainly nothing like her violent counterpart in Teen Titans Go! 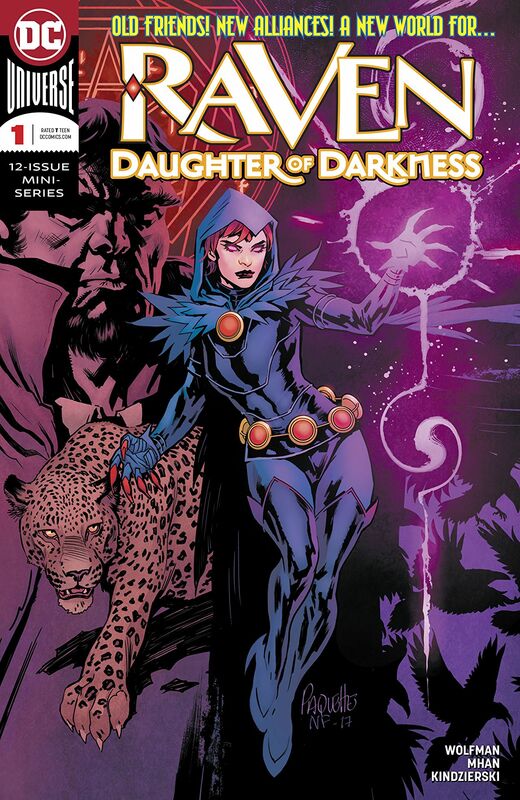 Given that, Raven: Daughter of Darkness #1 will prove something of a revelation for fans of Raven, regardless of how they first came to know her. Given that Marv Wolfman has returned to write this mini-series, it’s no surprise that the version of Raven we see here is closest to her classic comics incarnation in terms of character. Rachel Roth differs from the original Raven, however, in that she is trying to develop a life outside of her superheroics and is struggling to learn more about ordinary humans and life on Earth after being raised entirely in the plane of Azaroth. This includes staying with her aunt and uncle in San Francisco and developing friendships with a group of local teenagers, who write off Rachel’s overly formal speech patterns as the result of her being home-schooled alone for way too long. This proves a brilliant conceit on Wolfman’s part. Not only does this serve to develop Raven better as a character but it also makes her into a more sympathetic figure. While not every reader may have been as painfully awkward as Raven growing up, most will be to relate to her fears of opening up too much to others and her need for secrecy… even if her reasons for those feelings go beyond the usual teenage paranoia. There are also some wonderful little moments that emphasize Raven’s ability, as a person, to find the magic in ordinary things such as her reaction to seeing Christmas decorations for the first time. Unfortunately, the artwork doesn’t quite match up to the script. Pop Mhan is usually a fantastic artist but the inks for this issue are horribly erratic. Most of the pages look fine, with the inks barely outlining Mhan’s original pencils, which suits his sketchy, detail-driven style. Unfortunately, many of the scenes set in darkness (such as the opening page) are heavily over-inked in such a way as to make it seem like black paint was spilled on the page and hastily wiped off. These moments are few and far between, thankfully, but they do throw off the visual rhythm of the reading experience. Despite this, Raven: Daughter of Darkness #1 is a solid read. You don’t have to have any pervious experience with the character to enjoy this book. In fact, new readers who don’t have any expectations of what they’ll see, may get more out of it than those who think they know Raven from the cartoons or classic comics. Just come into this book with an open mind and you’ll enjoy getting to know Rachel Roth. 8/10. Raven: Daughter of Darkness #1 comes out January 24, 2018.